3 Bedroom 2-1/2 Bath Vacation Home on a Large Creek with Game Room, Hot Tub and Fire Pit. Sleeps 9 Guests. We had a fantastic time. In many ways, it was just like being at home. We are definitely making plans to return at The Buck Stops here!! Splendid screened porch and view of Creek and mountains in back yard. Close to town and very nice house. 5 Stars! Great Spring Stay! Seven of us (4 adults and 3 kids) spent most of an April week in Red Feather and would gladly do it again. Instructions and descriptions were accurate and no surprises. Lots of space for us to spread out across three floors. The kids played a couple of days at the resort community pool, tennis and putt putt golf. We spent some time at the river side and did some hiking. Lots of deer sightings. We burned a wood fire one night. A great week of relaxation which was what we were looking for. Already talking about a return visit to the same cabin. We have enjoyed coming to this cabin for years. Always clean and peaceful. We plan to be back. We enjoyed Deer View very much. Its clean and comfortable. Housekeeping does a great job. A Winding Creek is beautiful. We love the decor - it was so neat and clean - the outside space and the finished basement. We loved it so much and cant wait to come back! Perfect! We stayed for two nights with our family. We were in town for a wedding. The house was very clean, spacious and safe. It had all the amenities we needed. It was also very convenient to town and all the Apple Festival activities. "A Winding Creek" is a 3 Bedroom 2-1/2 Bath Luxury Home on a Large Creek with Game Room, Hot Tub and WiFi Wonderful mountain escape The house is in a great location. No gravel roads to access. The set up was perfect for our family. The master is on the main floor with the other bedrooms in the basement. The kid cave. 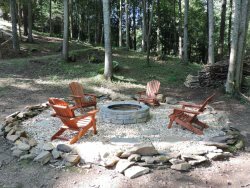 There is lots of land with a picturesque fire pit by the creek. The kids played in the creek for hours. There is also a nice flat area by the creek perfect to play ball. If that was too much activity, there is a hammock and chairs. We would definitely come back. Great Cabin and Area Red Feather (cabins name) fits our needs. I cant think of anything the cabin was missing. We visited with our family of 5 and friends with their family of 4. There was plenty of space and bedding for all. Wifi worked well, and TVs in master, living room and basement had DirecTV. There is access to a Recreation Center at the resort that has a large indoor pool, tennis, putt putt and an arcade. The cabins basement also has an assortment of games with a hot tub and fire pit. The cabin is part of the Coosawattee River Resort, so there is fishing available in multiple locations nearby, whether your interested in pond or fly fishing. Downtown Ellijay is within 20 minutes and was full of cool craft shops and some unique restaurants. There is a Wal-Mart 10-15 minutes away with several mainstream restaurants nearby. There are plenty of hiking options within an hour, and there are several apple orchards with family activities just outside of Ellijay. Highly recommend! "The Buck Stops Here" is lovely. We really enjoyed the cabin - peaceful and a great view. Our pets had a great time too :-) Thank you Mountain Resort Cabin Rentals! Peace Personified!!! A Winding Creek is on such a lovely property and feels very safe and quiet and special. It is well stocked with every essential, and extras are perfect! If you want a peaceful respite, THIS IS IT!!!! The screened porch is just wonderful...you can see, and hear, the creek. When we were there, it rained at about 8 p.m. both nights and, all things combined - it was blissful...We spent most of our time on that screened porch...it was just that lovely! And the service? Top Notch! I got immediate responses to every question prior to rental, and immediate responses when I called after arrival about things I couldnt figure out. We had a wonderful time. The place is beautiful and clean and obviously cared for. You really cant go wrong here...its truly a "get-away" in every sense of the phrase! Thank you guys for all of your help and best wishes for continued success with this rental property. Its really lovely and you guys still remember what "customer service" means! Great place for families White Water is a great set up for a family. It has the cutest little bunk beds that my 2 year old loved! I also really liked the layout with 2 bedrooms on the top floor so my 2 kids each had a room on the same floor. The best feature of the house by far though, is the screened in porch overlooking the river. We ate breakfast there daily as well as some other meals and spent plenty of time in the rocking chairs and swings. The house is equipped with everything you need and even has toys for the little ones as well. It is pretty far back in the resort so it is secluded like it says. We saw tons of deer (like more than I have in my entire life), and geese. There is a nice fenced in side yard that the dog was able to go out into and do her business so that was a plus as well. We would definitely stay here again! I gave this little piece of heaven 5 stars We loved White Water... My fianc & I took my daughter, son in-law my 2 granddaughters & their dog.The home is gorgeous & so inviting. We were right on the river & you can hear it inside the home with all 3 sliding glass doors open. It is very private & was very clean.The huge screened side porch was so nice. I am very selective about the rentals i choose...they must be on a river because we do a lot of fishing. Also the home must have lots of screen doors, king master on main level w/comfortable bed & opens to a screen porch or balcony, a large screen porch w/ dining table, be well stocked & this cabin had all of this. Red Feather was an awesome experience. Everything was fine: cabin neat and clean plus the description of the cabin on the internet was accurate. Dream Catcher is a Great Place! It was neat, clean and looked like the internet description of it. We will be back. River Daze is a beautiful, secluded waterfront cabin. We love it here!! Its a great place and we will definitely come back. Good Things Come to Those Who Book Vacations! So glad we stayed here. A lovely way to relax and reconnect with the family. Red Feather was just perfect for our family! We had such a pleasant time. The fire pit outdoors was amazing! Our kids loved it so much that they asked to stay forever. If you have the chance I recommend that you stay here.